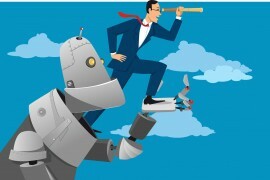 Small business financing provider Spotcap has implemented Kofax’s Kapow robotic process automation (RPA) software, reports Julie Muhn at Finovate. The Kapow software automatically aggregates, extracts and transforms business and cash flow data into actionable information. Leveraging this information, Spotcap’s machine-learning (ML) credit models offer underwriters insight into a company’s creditworthiness. The application takes businesses only 15 minutes to complete and are reviewed within 24 hours. If the application is accepted, businesses gain access to funds immediately. Kofax’s CEO, Reynolds C. Bish, notes that when fintechs digitally transform their operations they are poised to better serve their customers and will “thrive by developing deeper and better engagement with customers across their entire lifecycle”. It seems that ML, automation, and artificial intelligence (AI) are much more than just buzzwords for Kofax. In January, the company announced its largest single transaction for an RPA solution. The order, which came from a top ten global bank, totalled more than $8 million. Founded in 1985, Kofax offers products ranging from information capture, RPA, financial process automation, and customer onboarding solutions. The company’s network of more than 1,000 partners in 70+ countries across the Americas, EMEA and Asia Pacific, leverage Kofax to serve 20,000 end customers. Last May, Kofax was acquired by Thoma Bravo, marking Kofax’s second acquisition after Lexmark acquired it for $1 billion in 2015.